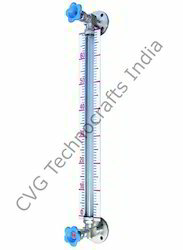 Manufacturer of a wide range of products which include tubular level indicator. We feel proud to introduce ourselves as the leading manufacturer and supplier of a superior quality Tubular Level Indicator. Suitable for storage tanks, Batch tank, Day Tank, Receiver Tank, It is simple & reliable devices for direct reading in atmospheric or pressurized tank application. This tubular level indicator is manufactured at our sophisticated manufacturing unit by consuming utmost class base material in line with market norms to guarantee flawlessness at customer’s end. The offered tubular level indicator is accessible in varied models as per the application necessities of the customers. Along with that, we also modify this tubular level indicator as per information laid down by our customers to fulfill the customer’s requirements.